Home :: Lighting :: 3-Arm LED Ceiling Light with Clear White Shades, Battery Op. 3-Arm LED Ceiling Light with Clear White Shades, Battery Op. 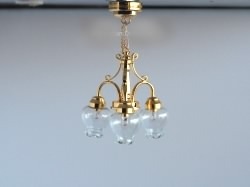 Battery-operated traditional 3-arm ceiling light in brass finish with clear glass shades. LED bulbs last approximately 5,000 hours. Comes with extra battery.